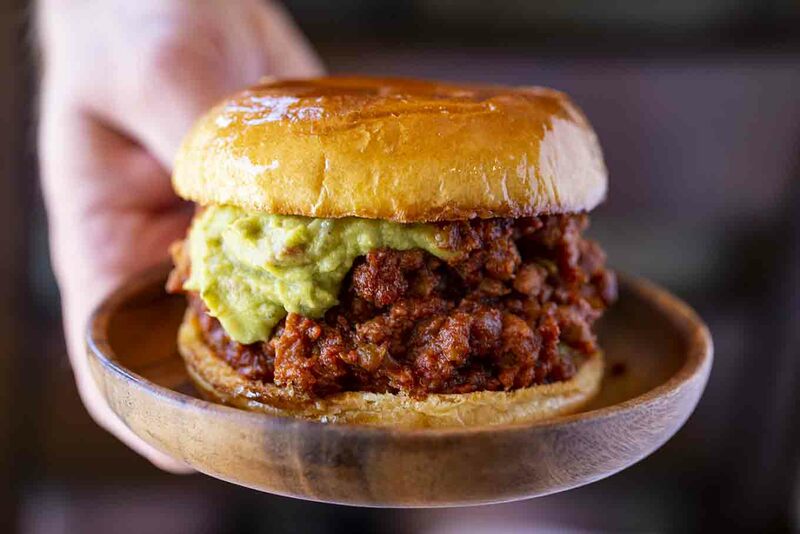 It’s time for another recipe in our ever-growing Sloppy Joes series! 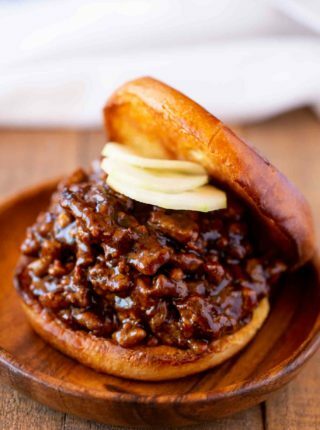 Last week we made Teriyaki Pork Sloppy Joes, a sweet version of my popular Ultimate Sloppy Joes recipe. Chorizo Sloppy Joes are the latest sloppy joes we’ve made in our kitchen, and we still have more coming each week. These are seriously amazing, with savory pork and chorizo, paired with brown sugar and seasoned tomato sauce. You can use sweet or spicy chorizo, your choice. Personally, I like to go spicy, because we know how to handle the heat in this kitchen. A more kid-friendly version would be the sweet chorizo, but of course adjust accordingly to your tastes. Sloppy joes happen to be the perfect dish to meal prep for the week. You can even freeze the parts ahead of time, then just throw them together when you’re ready! Make extra sauce in a separate container, just in case your joes dry out a little bit when cooking them for a second time. Brown the pork and chorizo, then prepare as per the directions. Stop before the sauce starts to thicken. Let cool and store refrigerated or frozen in an airtight container. Reheat on the stovetop with a few tablespoons of water and the extra sauce. Top with guacamole when serving on freshly toasted buns. If you made them spicy and some people need to cool down their palates you can also top them with sour cream. Sour cream goes a long way in cooling down spicy foods. In a pot over medium-high heat, brown chorizo and pork together with onions and oil until pork is mostly cooked through, about 5 minutes. Then add to slow cooker. Add all other ingredients to slow cooker and stir together. When it’s just about done, toast the buns (with or without butter). 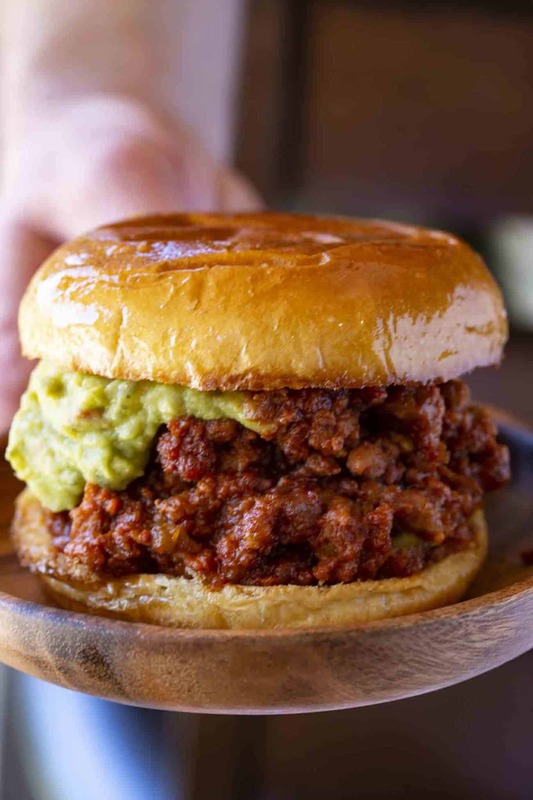 Build your sloppy joes by scooping mixture evenly on buns and topping with guacamole before serving. This recipe works best with pork, but you can sub in ground beef or turkey if that’s what you have. 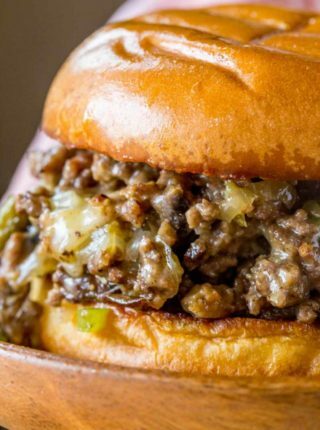 Butter gives the toasted brioche buns a better chance of standing up to the sloppy sauce in your sloppy joes, so I definitely recommend toasting them first! I like to have everything prepped and ready to go before I start cooking, especially since these sloppy joes recipes cook FAST. Stop cooking the sauce just as it starts to thicken, as it will thicken a little bit more as it gets cool. I’d love to know how it turns out for you so if you do make the recipe pretty please come back and leave a comment letting me know how you enjoyed them. 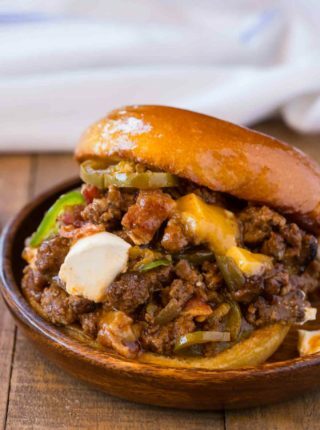 While you’re here, make sure you check out one of my all-time most popular recipes, Philly Cheese Steak Sloppy Joes. We put a whole lot of effort into painstakingly recipe testing ALL of these Sloppy Joes, just for this weekly series! In a large skillet add the canola oil, pork, chorizo and onions, cooking well, breaking it apart but leaving some chunks for 5-6 minutes. Add in the brown sugar, canned tomato puree, salt and pepper, cooking until the sauce starts to evaporate and the mixture becomes "sloppy" (about 5-6 minutes). Spoon the mixture onto the toasted brioche buns and top with guacamole. I have some ground turkey and chorizo in my freezer, I wonder how this combo would work? 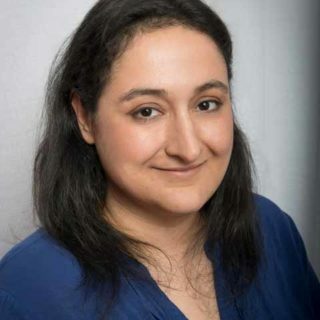 Like Kirsten below, I also have italian sausage. 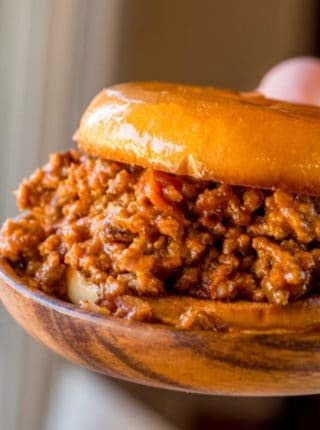 Was thinking on making a chorizo pizza, but now have a taste for sloppy joes because these look so good. I find myself currently with an assortment of 1/2 lb. increments of various ground pork products in my freezer, leftover from other recipes. I’m meal planning and was asking myself what the heck to do with ground pork, chorizo, sweet italian sausage, and pancetta. Make the weirdest meatloaf ever? Yay!! I hope you enjoy it. 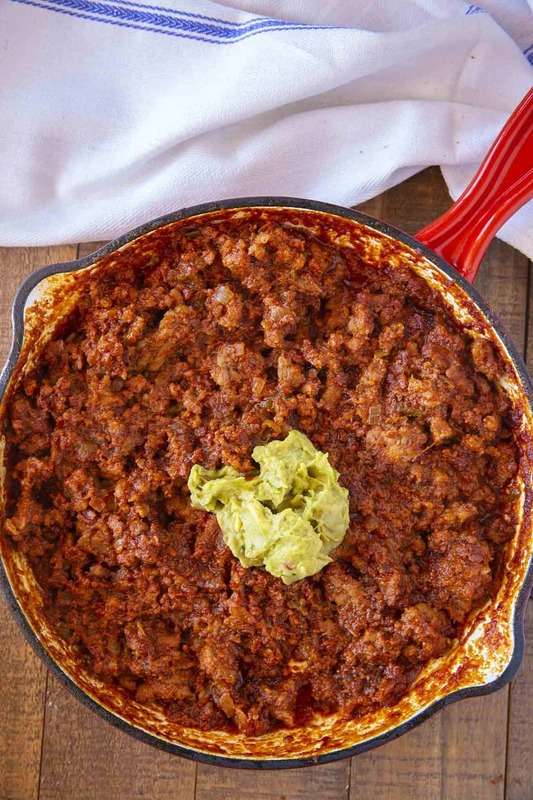 I love chorizo & adding it into a sloppy joe is delicious!! I know these will be a hit with my extended family! 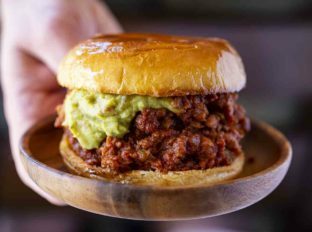 These are the ultimate sloppy joes! So much flavor! This is the best sloppy joe of all time! This is my love language! I love me a good sloppy joe! Can’t wait to make these, especially for meal prep! Great recipe!